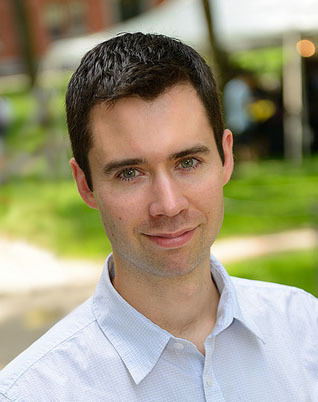 Michael’s lab uses computer simulations and theoretical modeling to discover the physical principles that govern assembly of cellular machines and dynamic pattern formation in living and non-living systems. One focus of the lab has been understanding virus assembly. During an infection, a virus hijacks the machinery of its host cell to produce new copies of its genome, proteins and other components. These components then assemble into new viruses capable of spreading the infection to other cells and organisms. For many virus families, a protein shell (called a “capsid”) must assemble around the genome in order to form an infectious virus. Michael’s lab has developed computational models which predict how this assembly process depends on factors such as protein charge and the structure of the viral genome. Simulations of these models reveal aspects of assembly pathways which are too short-lived to be characterized by current experimental techniques, and identify parameters that control whether the virus assembles or misassembles. This information could make it easier to design antiviral drugs that interfere with assembly or to redesign viruses as gene therapy delivery vehicles. Recently, the lab found that when their model was applied to specific viruses, nucleic acid structures which were predicted to be optimal for assembly closely matched the genomes for these viruses. This finding suggests that how the physical properties of the genome contribute to assembly is a key selective pressure on virus evolution. A second focus of the lab is on the patterns and dynamics that emerge in nonequilibrium materials. Such materials include suspensions of molecular motor proteins and cytoskeletal filaments, collections of swimming bacteria, or systems of colloidal particles that mimic the ability of bacteria to propel themselves due to catalytic reactions on their surfaces. Simulations from the lab recently showed that collections of such self-propelled particles undergo a new kind of phase transition, in which propulsion drives the formation of dense, highly ordered, macroscopic clusters of particles. Understanding the spatial and temporal patterns which emerge in these systems could pave the way for designing new “active” materials that dynamically respond to or perform work on their environment, and may shed light on the sophisticated self-organization found within living cells.